If you put a big enough stone in a place, it begins to fill it with stories. Look at Stonehenge. Or that King Stone which sits outside the council chambers in Kingston. Look the Scottish standing stones, like those on Islay. They can be tall and thin or squat and crouched, watching men walk by. I pass them, every now and then. On a local walk not far from Ascot there is the Quelm Stone, a low stocky lumpish thing; and wandering in Horsham Woods, looking for the place HG Wells’s martians landed, there was another; smaller, less swaggering. But no-one had moved it for a very long time. They seem to be markers; boundary stones. They are part of place, and no-one wants to disturb them. They squat there like irascible ogres-in-waiting. They have a personality, and quicksilver it is not. When they are moved there is often a to-do. Round these parts we don’t hold with folks moving stones. Take Cookham for example, the village on the Thames which charmed Kenneth Graham, and Jerome K Jerome, and so many more. 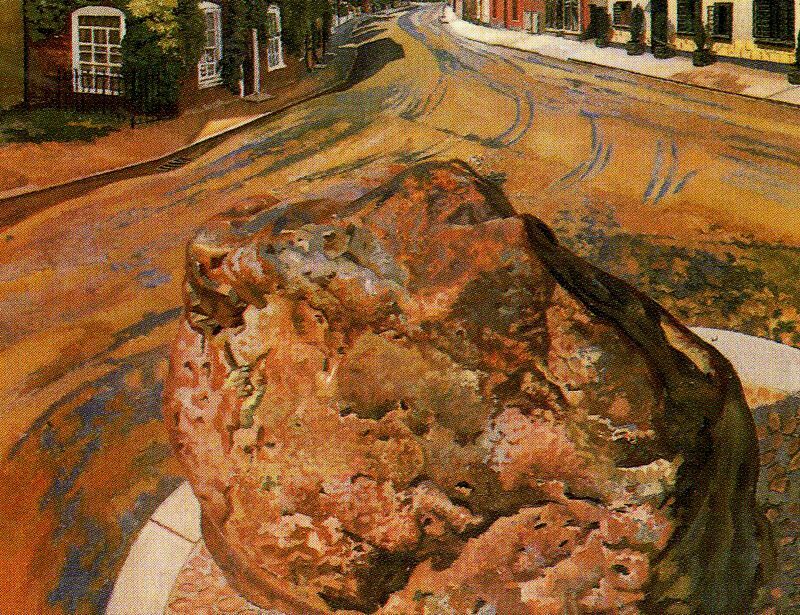 Cookham has a stone which, like so much about the village, captured the heart of its savant resident artist: the artist Stanley Spencer. That’s his snapshot of it, at the outset of this post. Full of energy and bulk and presence. It has been in Cookham for as long as anyone can remember anyone remembering. And it is called the Tarry Stone. People beat the boundaries – walk the paths which surrounded a settlement- all over England. And in Cookham, for as long as anyone has been recording those annual walks to keep pathways open so locals might continue to enjoy right of way, they have been recording the Tarry Stone. Tarry means: to wait. To linger. It used to linger at the fork in the road where one track went off to church, and the other to the Thames ferry. It sat near Dodson’s fence and observed, in that way these rocks do. Locals used to hazard that it was a great rock which crashed here from space. But it’s local sarsen stone. It marked the edge of the property of a very powerful man, it’s said: the Abbot of Cirencester, who had a nice house nearby. Cookham Manor court rolls say villagers used to play sports there. And it is the centre of the home territory of that fearsome fiery ghost, Herne the Hunter. The stone sits stolidly, it is said, whilst the sound of the spectral huntsman’s horn sounds across the common and Herne’s wraith-hounds charge across the nearby flat spaces. Like every decent stone, it has its special powers. They were not tested until someone took it into their heads to move the stone. A man called George Venables moved it into Mill House Gardens, nearby. And immediately, the family began to have problems. Locals concluded that the family was cursed because it had moved the Tarry Stone. Naturally, and with all speed, the Venables moved it back again. If you put a great big stone in a place, it begins, effortlessly, to fill it with stories. And the Tarry Stone is no exception. 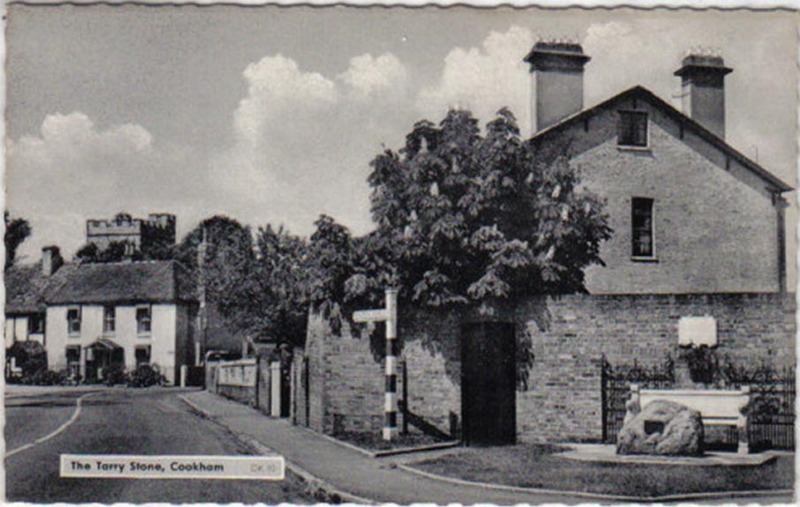 Posted in Places to visitTagged Cookham, england, history, megaliths, stones, the tarry stoneBookmark the permalink. I have now wandered around the garden, fearfully looking at each stone and wondering….. I shall show this to my Tom, who is a great stone appreciator and known to sneak, er, carry stones home in his suitcase, hoping I won’t notice. “No, dear, I’ll carry that”. A tarry stone – a waiting stone. A good thing to have about a place, as long as it is in its proper place, it seems. I think the world could do with a few more, Penny. I’d like one in my back garden! Reminds my of my little boy and his obsession with stones – ones that fit his young hands mind you! Hi Tony! Stones come in all shapes and sizes, to fit small hands and large cities 😀 I love the thought of a stone which came from a personal planet. Even better than having your own luxury island. There was a giant untended vacant lot behind our house when I was growing up, in the midst of which was a huge flat rock. I spent many an afternoon on that rock, with books, or army figures, sometimes a lunch. It was especially awesome in the middle of summer, when the grass all around it would grow so high I could pretend the rock was a ship floating through the ocean or outer space. And that, right there, is why big squat stones are so special. I couldn’t have written it better than that if I tried. Thanks, Domingosaurus. I loved this. Every village, every place should have a Tarry Stone. I have often that stones are the keepers of memories hence them having tales to tell! They stand still while the world whirls around them, Joss! For us it is Plymouth Rock but it is probable that far too many in contemporary US have any knowledge or regard for it. I’d love to see it, one day, Carl. It does, Andra. I have a huge stone sitting on my mantelpiece, a Cornish thing with layers. It makes me laugh. I couldn’t exactly tell you why; I might take a picture and post it on FB…. The stone in the postcard looks eminently moveable, as though it’s in the way of the bench. Stanley Spencer’s view looks as if all the villagers have fled and the stone is ready to absorb into itself anything that is left. A serious stone: not a stone around which to Tarry. I am only about 20 minutes drive from it, Roger, and so I shall go and test-tarry and report back. That top photo looks a bit Toadish . . . a toad in the stone squatting and tarrying before rolling off to gather moss. Oh, wait. A rolling stone gathers NO moss. I might as well tarry a bit longer then. Mom picked up rocks and stones wherever she went . . . a lifelong fascination, I think. You can never tell how a stone will take someone, Karen, can you? Maybe even strangers will sense the stories beneath the surface. I hope it will be cherished. It sounds like you have done so. In one of my college film classes, we watched a film about two stones moving at regular speed, while civilization came and went in high-speed around it. Time, I suppose, is about perspective. A moved stone may be a grumpy thing. It sounds like a brilliant film! And I think you have hit the nail on the head. Time is about perspective. And perhaps having these great old stones around is a way of borrowing the perspective of Mother Earth herself. I’m looking forward to a summer of posts like this when Blessed Penguin get you to go walkabout. I lift little stones from beaches and bring them to the family grave. Fiona, what a beautiful thing to do. I think I shall adopt the same habit. The Summer: let us wait and see. I promise to write about these things whether or not the Order Of The Blessed Penguin invites me into its inner sanctum. I bet there are some stories round your holiday beach too. Would love to hear those. It is a mystery! Enjoyed your tale. They do, Judy. i had forgotten pet rocks! I really enjoyed learning about the Tarry Stone, Kate. I could venture into bad puns about the stones being part of the bedrock of history–but I wouldn’t do that! We have a lot of river rock in our yard simply because we think it’s beautiful. These historical markers you describe are really impressive and I like to think they have reasons for being exactly where they’re placed–so no moving about! Fascinating Kate. Your post caused me to rant through google looking for photos of a rock in Washington that carries a similar history and I can’t find a thing. It’s been moved to a state park. Hmmm perhaps deserving of a post one day. yes indeed, near to me there is a stone known locally as the Wesley Chapel – the travelling minister John Wesley made a habit, it appears of giving sermons from rocks by the roadside. Now me? I am sure the rock in question was not used by the man, but it is a great story.